Recycling is important to me. My family have recycled as long as i can remember. It is not a new thing. My folks, with no money and three small girls in the late 60's, early 70's .. well you just were thrifty. I think perhaps 'saving' things for possible future use in my genes, along with my tendancy towards clutter! When i was 16 i took an evening class in indigo dying and batik, funnily enough with Alice (we have known each other a long old time!). My dad made us both a batik frame from the old wooden clothes horse that my mum had used to dry my cloth nappies on. He had kept it in the loft and then reinvented it years later. Also my mum was a primary teacher so egg boxes, cereal packets and the like were always saved in true 'Blue Peter' style. Nowadays we are all more aware about waste and are hopefully moving towards reducing what we consume as well as continuing to recycle. I am always interested in how materials are reinvented and recycled and i would like to share with you some interesting products and people i have come across. Please click on the highlighted links to view their websites. 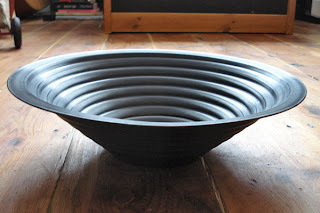 Bowls made by recycling old LP vinyl records. We were after a particular artist so emailed them and had to wait a bit but it was worth it. The bowl arrived and we were delighted. What's more we didn't think about the date which would be on the record and by shere fluke it is 1967 the year he was born! wow.. how about that.. very pleased.. now i hope he will like it. A few weeks ago i went a local Festival of Crafts and came across Joanne Tinker who recycles metal bottle tops from beer bottles and creates beautiful pendants, earrings and brooches. I was excited by these and very tempted, but she was very busy and i didn't get a chance to speak to her. Her necklaces were my favourite pieces. 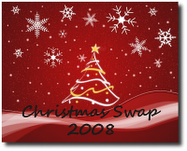 She also had little box frames containing tiny sweet wrapper cups, a great idea and so colourful. My sister and i used to make these when we were children so they felt particulary nostalgic. There were a few other artists recycling.. Elizabeth Cook recycles fabrics.. mainly old woolens which she felts... not a new technique to many bloggers yet i thought her use of colours and the simplicity of her designs was good. I was also inspired by Julie Roberts who uses textiles and handmade paper. Paper making and papier mache are techniques i loved using whilst at art college and hope to experiment with again soon. Her lampshades were like jelly fish sea anenomes. They were quite large and in real life stunningly beautiful. She is based at the Museum of English Rural Life in Reading if anyone is near and is interested in searching her out. Another interesting exhibitor from the festival was....Elizabeth Beverley with her beautiful plant dyes wool for knitting. I would love to do some natural dying. I have my mum's old recepies from when she studied natural dying.. i even have her old dye vat in which i remember her steeping onion skins and other such raw material, when i was a child. I always loved the wooden tongs she used.. i wonder if she still has them. I would also love to knit. I come from a family of knitters.. even my dad knits. I am the one that sews rather than knits but i had the urge the other day to do some knitting when i saw my girls knitting with 'nana'. I went out and brought some yarn and am now the proud owner of a cotton dishcloth. 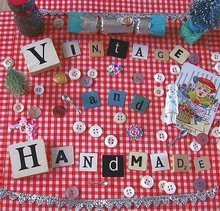 I already have 2 bought from a friends craft stall a while back, they really are good and have a great abrasive quality. I think i will make some more.. it may help me to enjoy cleaning a little more. Anna Roebuck's Bags to riches.... Anna is an artist who recycles plastic bags in to jewellery, art and lights. Doy bags ......colourful, fun bags and home accessories made from recycled juice packs by a women's cooperative in the Philippines and Remarkable recycled stationary goods. Hope you find some of these links useful and if you know of any interesting other links please leave a comment. Do you know these 'guys' ragbags.net ? thanks for that.. i had come across ragbags but not www.wornandwashedfabrics.com . 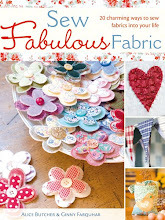 They do have a website and they look great.. the fabric choices and colour selection are lovely. When we close the studio in the new year, we will need to sell off some of our fabric stash, probably in this kind of way.. we have just too much now to keep it all. I am with you on recycled things. In this household we try to recycle everything wherever possible, and it infuriates me when lots of other people don't seem to care - and these complaints all over the news about rubbish collections being every two weeks...! It's an excellent idea to make people think about what they do and don't recycle! I think the current trends are towards greener issues and I for one am very glad indeed! 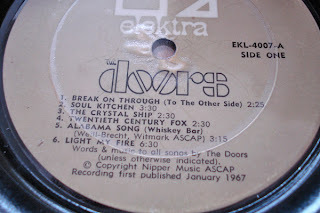 The vinyl bowl is heavenly - especially as it's a Doors album. You've just got cool points for that! I love this post! I went to all the sites you had linked. Wonderful work by all! I also grew up in a recycling household - short of money, not prepared to buy much, haunters of jumble sales. It was a great way to grow up though I do wonder whether it is to blame for my clutter problem . 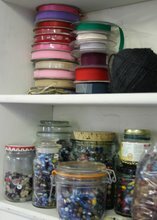 .. those corks will come in handy - well lets just hang onto thoses sewing machine bits... I'm sure we can fix that . . .yeah sure we'll take that .. . You are throwing it out? . . .
Glad you like the bowl girls and that you are finding the links useful.Thanks for your comments. Like your soap box Tash.. keep it up! and Jane.. i completely think that growing up in a recycling household is to blame for my 'clutter' problem.. the thing is my husband is the same... computer bits, motorbike bits.. old bits of wood.... he's delightfully, very 'Heath Robinson'. I am reading a book on clutter (on the side bar) .. i am enjoying reading it (when i can find it under the books and clutter next to my bed!) As we have a small house it's all about good storage for me.. if i have good storage then i can keep all these potentially 'useful' things. Happy clutter and happy recycling. Hello I just found you via Treefall. Beautiful beautiful things you make. I used to live in Farnham before moving to Canada, so would have loved to have seen your stall at Wisley...your website looks very tempting! Definitely agree about the recycling thing. I try to use as many recycled fabrics in my things as possible. The downside is that my house is full of 'bits' waiting for a use!!!! Being a little older than uou !! 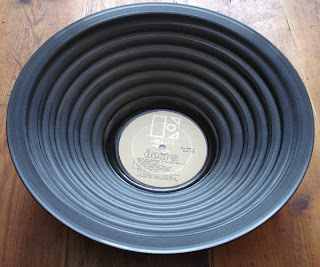 I remember making fruit bowls out of old vinyl records! They were bendable when warmed in boiling water. I think my mother took them to school events to raise money.